Known as the Mile-High City, Denver is home to a diverse cross-section of the United States. While visiting in October, we were in town specifically for the Great American Beer Festival, the largest beer fest in the U.S. But, this also gave us an opportunity to check out some other great sites in Denver for the weekend. Check out Union Station, which is the first place you will happen upon if you arrive via the A Line from the Airport. Union Station has some cool shops, bars, and delis within it….it also has a hotel and Amtrak station. Wander around RiNo District, which is the (relatively) new arts district. It’s still evolving and growing, but its art scene is pretty on point…including tons of graffiti murals commissioned throughout the area. They have a First Friday event with all the galleries, shops, design studios and restaurants opening their doors until 9. Take a day trip to Rocky Mountain National Park. We were able to get to Estes Park, have breakfast, hike 6 miles and make it back to Denver in one day. If you have time though, make sure to try and stay for a few days near RMNP! Get lost in one of the flagship REI stores. Located on the Platte River, right near the Highlands area of Denver, the 90,000 SF REI building used to house boilers and engines used to generate electricity for the Denver Tramway Co. rail system. REI purchased it in 1998 and renovated the interior with 3 floors. Snooze A.M: Even though this is a chain restaurant, it’s not a bad option when you get to Denver. There will probably be a wait, no matter what time you get there. Try the eggs benedict or the pretzel sandwich…the pancake flight also looked delicious, but we didn’t get it. Linger: If you are interested in a boozy brunch, check this place out in the Highland district. They have a $13 mimosa all you can drink. The place is also cool in general; it’s located in an old mortuary called Linger. Most of their décor is funeral-themed, such as old ads for coffins. Avanti F&B: This is a large collective food eatery. The concept is: grab a drink, grab a bunch of food options and share with your friends. We tried the red chili pork dumplings from Kaya and the Arepas from Quiero Arepas. Both were delicious! I wished we were more hungry to try some additional food options. 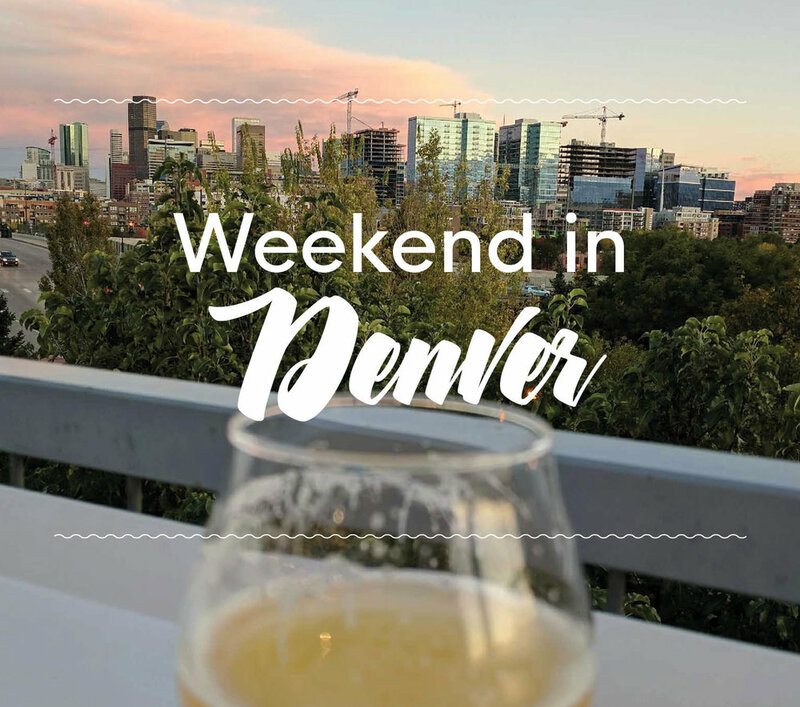 The place is pretty large…there are 2 stories, a huge rooftop patio with great views of downtown Denver and 2 bars. Check it out, but just realize…it’s pretty loud and crazy! Our Mutual Friend: This is a pretty small brewery, but also pretty cool. It’s named after a Charles Dickens book and has a homey, welcoming, hang-out-for-awhile feeling. Recess Beer Garden: Located in Highland, this bar/restaurant is a beer garden and includes board games to play. Goed Zurr: Located in the Five Points District, Goed Zurr translates to good acid in Dutch and it’s pretty unique in its offerings…only wild/sour beers. Although I am not a huge fan of sour beers, the bartender was helpful in finding something to drink. They also have a sweet charcuterie board…if you’re into stuff like that. One last tip: We stayed downtown, but I would recommend staying in an Airbnb in one of the neighborhoods instead. Have you been to Denver? What are some of your favorite things to do while you are there? Amy K. will also be back for a review of her hike in Rocky Mountain National Park! Sign up in the footer with your email to be automatically entered in our Hashtag 59 Photo Print Drawings!